Kick off the holidays right with the Monticello Holiday Classic 5K, taking place on December 1st! 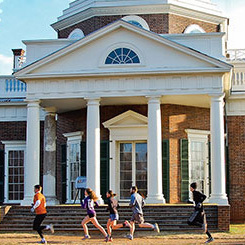 This family-friendly 5k runs through the grounds of historic Monticello, beginning at the East Walk of Monticello and ending at the David M. Rubenstein Visitor Center and Smith Education Center. Kids can also enjoy the Deck the Halls Kids Dash, a loop around the West Lawn within the shadows of Monticello.